In 1969, Roberts introduced proper and unit interval graphs and proved that these classes are equal. Natural generalizations of unit interval graphs called k-length interval graphs were considered in which the number of different lengths of intervals is limited by k. Even after decades of research, no insight into their structure is known and the complexity of recognition is open even for \(k=2\). We propose generalizations of proper interval graphs called k-nested interval graphs in which there are no chains of \(k+1\) intervals nested in each other. It is easy to see that k-nested interval graphs are a superclass of k-length interval graphs. We give a linear-time recognition algorithm for k-nested interval graphs. 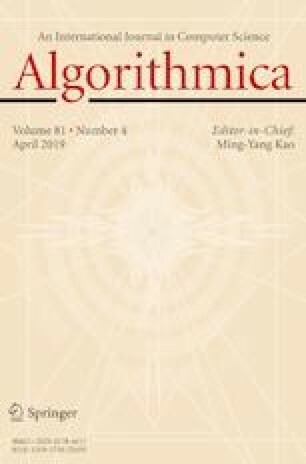 This algorithm adds a missing piece to Gajarský et al. [FOCS 2015] to show that testing FO properties on interval graphs is FPT with respect to the nesting k and the length of the formula, while the problem is W-hard when parameterized just by the length of the formula. We show that a generalization of recognition called partial representation extension is NP-hard for k-length interval graphs, even when \(k=2\), while Klavík et al. show that it is polynomial-time solvable for k-nested interval graphs. The conference version appeared in ISAAC 2016 . The first author is supported by CE-ITI (GAČR P202/12/G061) and Charles University as GAUK 1334217. Diagram For a dynamic structural diagram of our results, see the following website (supported Firefox and Google Chrome): http://pavel.klavik.cz/orgpad/nest_len_int.html. We want to thank Takehiro Ito and Hirotaka Ono for fruitful discussions, and to an anonymous reviewer for pointing out that nesting in also studied in .